Blogodidact: Mayor Guiliani - what do you mean by America, and why question only President Obama's love for it? Mayor Guiliani - what do you mean by America, and why question only President Obama's love for it? 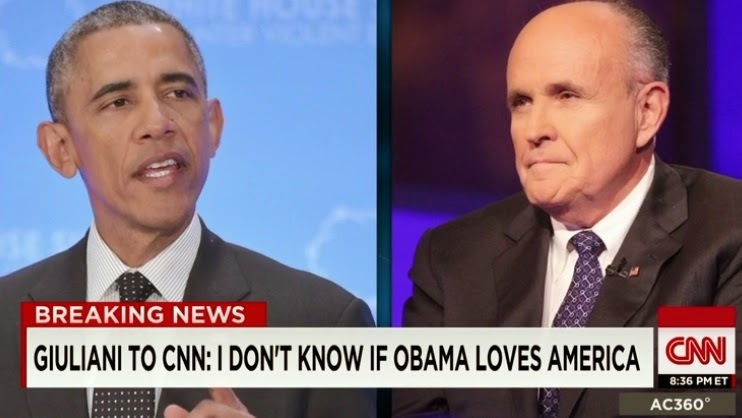 Have you heard what what Rudy Giuliani said about President Obama not loving America? Me too! Were you outraged? Me too! Can you believe he only said that he wasn't sure whether President Obama loved America?! Me neither! Huh? That's not what ticked you off? Well... why the hell not?! "... I do not believe that the president loves America..."
I'll go ahead and say that - providing that we first define what we mean by America - he didn't go far enough. The real problem with what Giuliani said is that he limited it to President Obama alone, as if the issue begins and ends with him. Why stop short of applying it to all of those of like mind with the President, who seek to impose policies upon America which are opposed to what it means to be an American, and which in doing so causes real damage to what America actually means and is? "GASP! How can you SAY THAT?!" Then again, I've got to ask how can you not say that? Look, America is not a typical nation. Unlike most other nations, America wasn't simply formed out of the ethnic identities of people who'd lived here for thousands of years. Unless you are a racist or a bigot, to be an American is not about being of a particular race, religion or ethnic identity, it's about being part of a nation formed from a set of ideas which were declared here, established here and fought for both here and abroad. If you don't accept those ideas, if you oppose those ideas, then by means of your own opinions and decisions, you've necessarily defined yourself as being anti - opposed to - what it means to be an American. To love America means, at the very least, to value, practice and support that particular set of ideas which are based upon the understanding that Individual Rights are not doled out by men but are inherent in the nature of man and irrevocable by men, ideas that value Liberty and recognize its requirements, and the determination to seek to preserve both through a constitutional Govt whose powers and laws are limited to upholding and defending those Individual Rights and the Liberty which results from them. Those who love America, love it not because (or at least not only because) it is where grandma baked her apple pies, or because it's a great place to go camping, but because they love those ideas and the liberty which they bring into all of our lives. So I'll ask again, unless you base 'loving America' upon nationalistic, ethnic, racist or some such bigoted foundation, how can you claim to love America while opposing the ideas which America was formed from? That doesn't mean, necessarily, that those who believe in that way are bad people - they could be swell folks, good family members, and they might even be fine contributors to the community (in a limited sense), but I do not believe that they can be said to love America - not in any meaningful sense. The plain fact is that those who support ideas which are antithetical to America's founding ideas of liberty and limited government, are by definition, by choice, by action, demonstrating that not only do they not love America, but that they are passionately opposed to it. If you define yourself as a leftist, a Pro-Regressive (of the Left or of the Right), a Communist, a Socialist, a Fascist, etc., etc., etc., then you, by your own choice and professed ideology, do not love America. How can you possibly claim otherwise? How could you claim to be offended by the clear meaning of your own ideas and positions? You might love the idea of replacing what it means to be an American, with what you'd rather America meant, you might wish to transform America into the idealized horror of your dreams, you might even love a particular geographical section within the borders of America, and some of those who live within them with you, but you do not love America. How is that possibly a controversial thing to say? And all it requires of you to justify saying that the President and other such people do not love America, is to ask them to explain how their own stated desires might somehow not directly conflict with America's founding ideas. It only requires that you have the willingness to ask them to define the ideas behind their oh so high sounding ideals, and the principles which their political aims rest upon. It only requires that you ask them to explain how their own ideals could possibly come to pass without directly opposing and violating those fundamental principles which this nation was founded upon. And of course, most of all - which, if you do love America, should be the least difficult of all - you will need to be able to briefly state and explain those fundamental ideas of Individual Rights and Liberty which America is defined by. BTW, the other side of the coin here, which should be obvious, is that anyone can come to these shores (lawfully, it should go without saying), and if they accept, value, practice and support those fundamental ideas of what it means to be an American, then they not only love America themselves, but they are American, every bit as much as, and in many cases more so, than those who were merely born here. No matter what country of origin they came from, or what religion they do or don't practice. I hope you get that as well. So Please. Whether you're from the Left, Right or Center, don't come running to me with your outrage for or against Rudy Giuliani's comments. If you understand what it means to be an American, the only problem you should have with Mayor Giuliani's comments, is that he limited them to President Obama alone. Excellent points. Thank you for expanding on the meaning of America, and that it isn't only the president who thinks this way.